For the last five years my auto dealership has purchased well over $100,000 worth of auto parts. Almost all of it came directly from auto parts stores. This year we will likely buy less than a tenth of that total from those same parts store goliaths. And it all comes down to two words. 48 hours is all it takes for me to get the parts I need for my dealership. Free shipping. Good reviews for the parts I order, combined with a VIN specific search that lets me find the specific parts I need for the repair..
Amazon has partnered with a variety of large parts distributors and manufacturers that already do business with the auto parts stores. For better or worse, everyone these days sells the same parts from a small group of suppliers. Just as supermarkets use their own labels for their cheap goods, parts stores use store brands to market parts that are often times identical. This isn't news if you have spent time online trying to shop for parts . What AC Delco sells to the O'Reillys and Autozones of the world, they also sell to the online based Rockauto, Partsgeek and JC Whitney. Hundreds of other manufacturers sell everything they can, to everyone they can. Until about a year ago the auto parts stores had an enormous competitive advantage over everyone else. If you needed it now, they were the only real game in town. New car dealerships typically sold parts that were far more expensive than the discount auto parts stores. The parts stores also saw fit to offer varying levels of warranties for the exact same part, which helped them avoid any serious price matching possibilities. If you own a repair shop, or retail vehicles, the so-called price competition issues between parts stores is even more of an exercise in futility. Customers usually can't wait a week for parts. You — me — doesn't matter. A repair shop also hates having to shop around because by the time we have made a few calls and tracked down exactly what you need, an hour of our lives can already be gone. And then... you may not even get the right part. "Automakers frequently change the parts that are used over the course of a lifecycle. For example, the 2004 Volkswagen Jetta with the 2.0 Liter had four different types of engine code fuel injectors that are completely different and not interchangeable. If you pick the wrong one, well, you're stuck." Retail customers deal with the same clusterscrews that we do when it comes to price competition and parts matching. Parts, even for once common vehicles, are sometimes stowed away at warehouses instead of the storefronts. That means you have to wait no matter what. So commercial and retail customers until recently had two choices. Either pay through the nose and get it now, maybe, or wait a bit longer and get a lower price from the online provider, and hope it's the right one. Amazon is solving this dilemma for the commercial customers and for millions of folks who do their own maintenance. It's not the best solution for the "need it now" customer, or for those who can wait a while and get the absolute lowest price. But it is a solid bridge between the two extremes of time and price. In my experiences, the prices have been at or near the low side of the scale. I'm crunching the numbers for my 2014 purchases, and the average price is working out to be about 30% less than what I was paying in the past. There are lots of times when I need a part immediately and Amazon can't fill that need, yet. This is especially true when I get new inventory that only requires batteries, a tune-up, new filters and fluids, and brake work. For everyday folks this is equally true. A simple and inexpensive repair can be done immediately and that gives the auto parts stores a competitive advantage. But when it comes to parts that have been priced to the nethersphere, and and aren't required right now, this is where the game is changing. The next steps in this industry should be interesting. As a car dealer who has been involved in this industry for nearly 15 years now , I can safely say that three changes will likely happen in the near-term. Amazon will start partnering with parts specialists that can already deliver parts on the same day they're ordered. For example, 1-800-radiator is a popular regional part company here in the southeast that already provides same day delivery for radiators, fuel pumps and A/C components. Amazon's marketing muscle, combined with 1-800-Radiator's regional distribution network, would tie in quite well with each other. 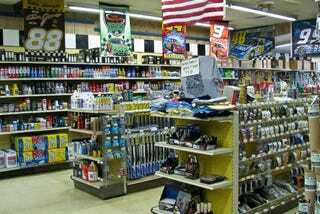 Auto parts stores will start delivering parts directly to retail customers. There may be a certain dollar minimum and a mileage radius, but the auto parts stores won't have much of a choice. The cost of this will likely be passed on directly to the cost of the part. As a guy who used to take companies public as a financial analyst, and as someone who has to order parts nearly every day, I can't help but think that the margins for the auto parts industry are about to be pinched very hard. Amazon has a virulent history of destroying the profitability of entire markets in the pursuit of marketshare, and there is little reason to believe the auto parts market will be any different. The O'Reillys, Autozones, and Advance Auto Parts of today may gradually become the Office Depots, Staples, and Office Maxes of tomorrow. Apps are already taking the place of direct online shopping at web sites, and if Amazon continues to remain the most popular app in modern commerce, this along with the right partnerships will likely help them develop the means to slowly take over the auto parts market.